It's pretty hard to look cool in a helmet. until Krash! came out with helmets, that is. 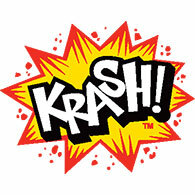 Krash! aims to design 'The Greatest Helmets on Earth', or at least the coolest. No longer are helmets stuck in a 2D world, Krash! offers the first ever 3D helmets for youth. Not only do Krash! helmets come with radical 3D features and awesome graphics, but all Krash! helmets also comply with ASTM / CPSC standards.